Jack Bauer really needs a hot tub! This iconic image of the lead character in the Fox classic TV series 24 about says it all. Well, it says a little more than that in the caption. But, Jack Bauer and his frenzied 24-hour evil-plot-foiling antics highlight the extreme need for the stress relieving powers of a warm and relaxing hot tub. Since the dawn of times, people have absolutely loved sitting in hot springs, hot baths, and now hot tubs. 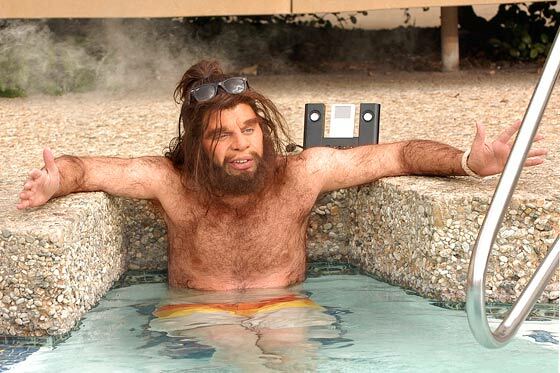 This picture of a caveman soaking away his troubles proves it, right? It just feels good. Whether it’s saving-the-world stress, running-from-mammoth stress, or just the stress of family, work, and your everyday life, a soak in your hot tub makes troubles melt away. There is actually a medical explanation for that feeling of tranquility and calm you get when soaking in a hot tub. Research by the National Aquatics and Sports Medicine Institute shows that warm water helps your nervous system balance itself, essentially removing the anxiety that excess harmful stress can cause your body and mind. So, if you ever feel a little bit like Jack Bauer, remember that peace, tranquility, and a better safer world are all just a 20 minute soak away. Can a dealer install a salt water system and not void Bullfrog’s warranty? Ron, I’ll have to check with our warranty department on this. I know it has been done. Send this question in an email to info@bullfrogspas.com attn warranty dept. with your contact info so they have a way to get back to you.